Answer: Well, I do know that chemtrails are one of many popular conspiracy theories. That’s why you’ll find so many websites devoted to the idea that chemtrails are a government plot. A Google search for “chemtrail” yields 1.9 million hits. And close to 20% of those websites are attempting to debunk the chemtrail conspiracy theory. The first thing I need to address is your comment about how anything other than a white color means it’s a chemtrail instead of a contrail. 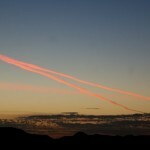 I did a post about contrails on Jan 1, 2010. These were the white-colored streaks people normally see forming behind high-altitude jets. In that post I explained what causes contrails to form. Look at the photograph above. It’s an image of some contrails taken near sunset (between the red clouds and the horizon). You can see they have a distinct yellowish color. Then take a look at the thumbnail below for another example, also photographed near sunset. It shows some salmon-colored contrails. Click to enlarge. In both cases, the contrails appear non-white because of the reddened light of the setting Sun. The contrails photographed for my Jan 1, 2010 post appeared around noon, with the Sun high in the sky. If you need to review why a setting Sun reddens the light illuminating the sky, see my post about Rayleigh Scattering. I don’t know if you’ve ever argued with a conspiracy theorist, but the few times I’ve done that (before I learned it was pointless) I’ve been met with skepticism, dogmatic recitation of supposed “facts,” and referrals to self-documenting websites with citations (if any) from similar websites. But I’ll say it again here: There is no chemtrail conspiracy. “How could I know” you may ask, “since it’s a secret government program?” That’s a popular rebuttal often used by conspiracy theorists. My answer is always the same: Government programs that large (and publicly visible) would be difficult to keep secret. There’s too many book and talk-show deals available to lure whistle-blowers away from “the cause.” For example, I already know a whole lot more than I ever wanted to about the private lives of US presidents. I encourage you to check out some of the websites debunking chemtrails. A good place to start is the ever-reputable HowStuffWorks. They point out that even normal contrails do contain some chemicals resulting from the combustion of jet fuel (water vapor, carbon dioxide, nitrogen oxides, sulfate particles, and fine soot). However, these are not “engineered” emissions designed for some nefarious purpose. Next time you see what look like chemtrails, rest assured they are simply contrails. No need to run inside or put on a gas mask or anything. Just enjoy the show. Those streaks in the sky are close kin to what you see when you exhale warm humid breath on a cold day.